Listen to Karl Schieneman, Founder and President of Review Less, an innovator in E-Discovery and the Hon. John Facciola, former United States Magistrate Judge for the United States District Court for the District of Columbia and well known E-Discovery thought leader talk with their guests Craig Ball and Tom O’Connor about their new E-Discovery podcast series, eDiscovery Channel. Craig Ball is widely known for his blog posts and the work he did for many years with LTN educating lawyers all over the country about forensics and e-discovery. Tom O’Connor partnered with the late, Browning Marean to co-host the first podcast series that I ever heard of on e-discovery called the e-Discovery Zone. 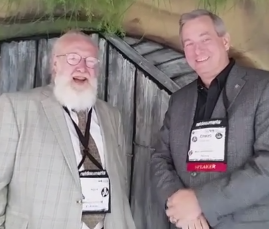 These two guests are witty and intelligent on e-discovery issues. We are thrilled to have them on our show to discuss their educational views on e-discovery topics.